Amla - Natural dermocosmetics and dietary supplements. Collagen creams. Amla is also known as Indian gooseberry or Phyllanthus emblica. Every part of this plant was used in Ayurveda. Amla from the Basic line contains Indian gooseberry extract, which is known for is properties that support digestion. It is an only ingredient that you will find within a capsule. There are no additional substances, e.g. fillers, which are completely useless for your body! Product ingredients: Indian gooseberry extract (Emblica officinalis), gelatine. 1. Who should use Amla product? 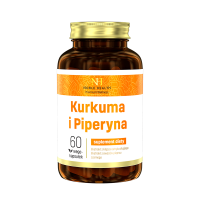 The main ingredient of the product is Indian gooseberry, which boosts digestion. That is why it is recommended for people who want to enhance this body function. 2. What is the composition of the Amla product? Amla belongs to the Basic line, therefore its composition is very simple - it does not contain unnecessary ingredients such as fillers. 3. What are the properties of Amla? 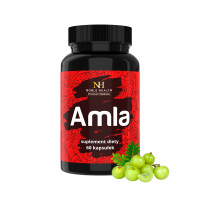 Amla is also known as Indian gooseberry stimulates digestion. 4. How to use Amla? 5. How to store the Amla product? 7. What is the net weight of Amla?